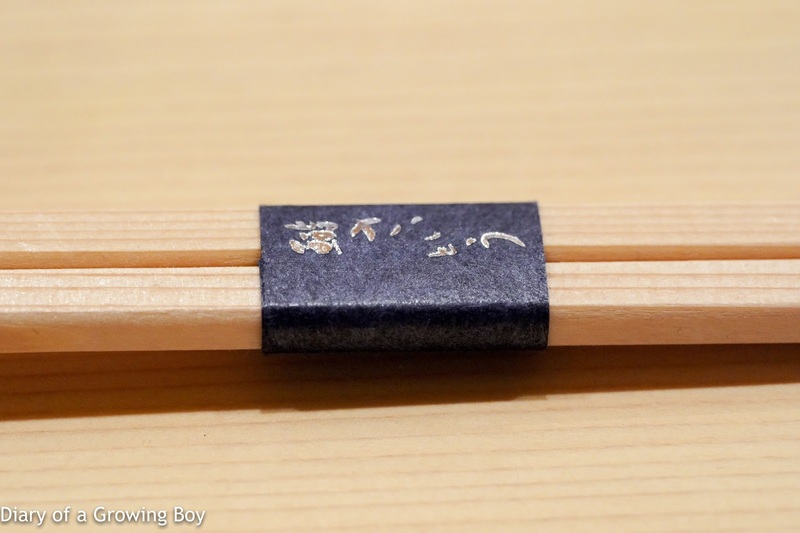 I have never been privileged enough to sit in front of Saito Takashi (齋藤孝司), let alone step into either the current or the old address of Sushi Saito (鮨 さいとう). Truth be told, I don't go back to Japan that often - certainly not as often as many of my friends. 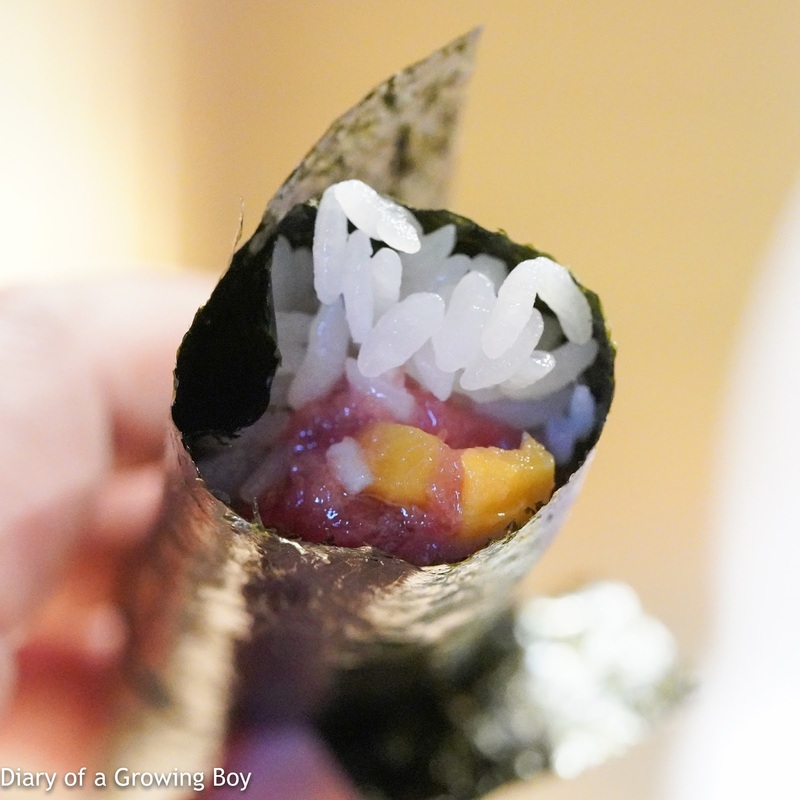 And whenever I do go back to Tokyo, sushi isn't always at the top of my dining priorities. So perhaps it isn't surprising that I have yet to be able to "tick the box" on this one. So I was pretty excited when word spread last year that Saito-san was opening a branch here in Hong Kong. I was even more excited when I learned that the local partner was none other than the group responsible for highly-regarded Japanese restaurants such as Tenku RyuGin (天空龍吟), Ta Vie旅, and La Bombance. Having maintained a good relationship with chefs at those restaurants over the years, I was given the privilege of being among the first group of people to pre-book my preferred dates during the soft-opening period - which started 2 days ago. So I booked 3 dates within the space of about 2 weeks. Chef DaRC and I dutifully showed up about 10 minutes before noon, as we had been advised to arrive early so that service could start promptly at 12:00 p.m. It would appear, though, that not everyone got the memo... as three ladies-who-lunch showed up only after we've had our first couple of bites. Only half of the U-shaped counter is currently open, cutting the seat count to just eight. Itacho (板長) Kobayashi-san would be the only itamae (板前) for now. We started with a pair of otsumami (おつまみ). 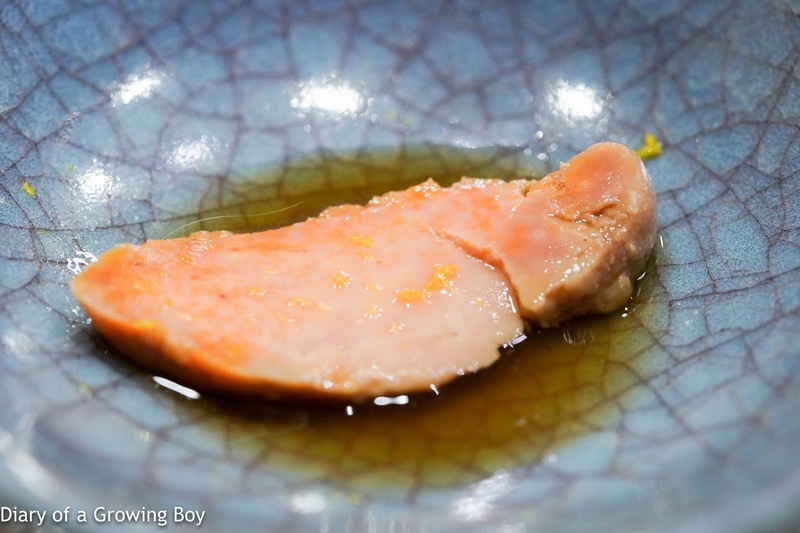 Monkfish liver (鮟肝) - very soft, very creamy... and kinda melted in the mouth. Good depth of flavor here, while the sauce was surprisingly sweet. Lovely fragrance from the yuzu (柚子) zest shavings. 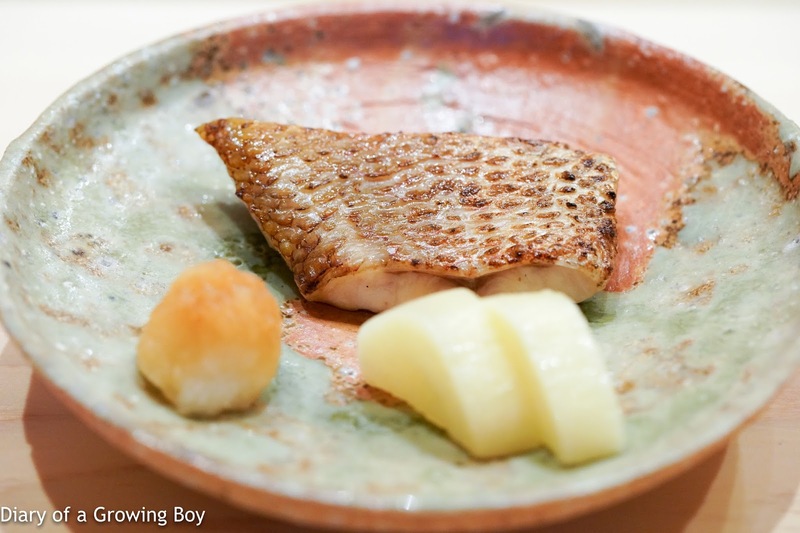 Rosy seabass (喉黒) - lightly grilled. 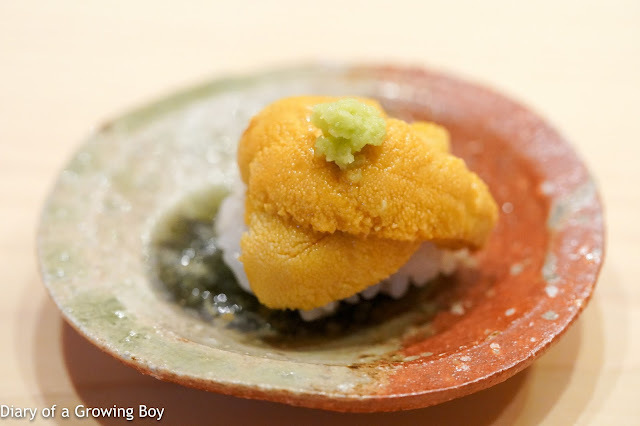 The fish itself is very fatty, and the texture was very soft. Delicious. We then moved on to the main part of the meal: sushi. Baby sea bream (春子鯛) - first thing we noticed was that the taste of vinegar in the shari (しゃり) was reasonably strong. The temperature of the rice was also relatively warm. 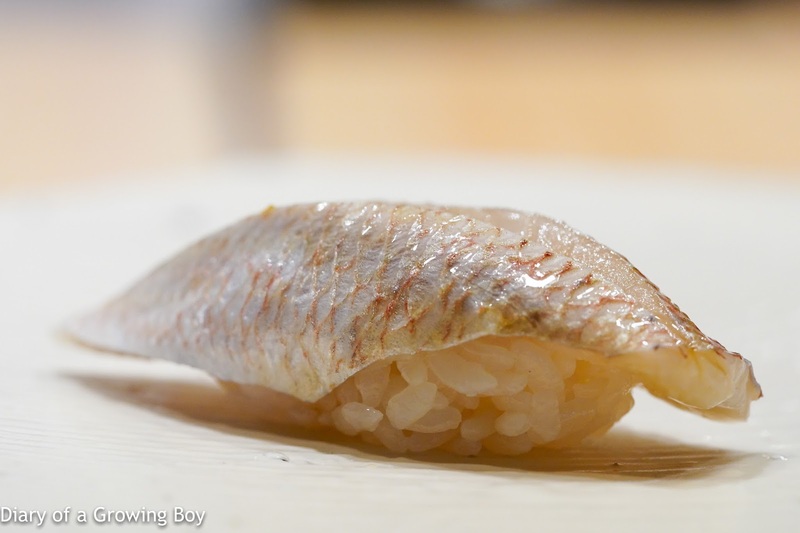 I also wondered whether the sea bream itself got some vinegar treatment. Golden alfonsino (金目鯛) - we often see golden alfonsino being torched to melt the fat, but this was served raw. The fat was still there, of course, so the texture was still soft and delicious... but of course firmer than fish that had been lightly torched. I chose not to tell the restaurant about any dietary preferences. I knew this meant that I would be served bluefin tuna, and I made the choice to try tuna here - as I did when I dined at top sushiya like Sukiyabashi Jiro (すきやばし 次郎) and Sushi Mizutani (鮨 水谷). Perhaps after the first few meals, I will tell them to serve me something else. 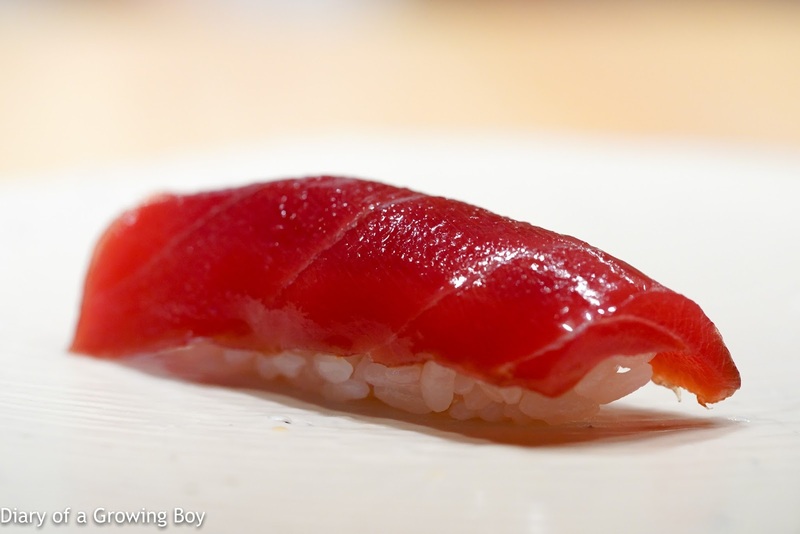 Lean tuna (あかみ) - nicely seasoned. Very tender. Very tasty. Curious about what seemed to be very fine grains of (salt?) crystals on top. 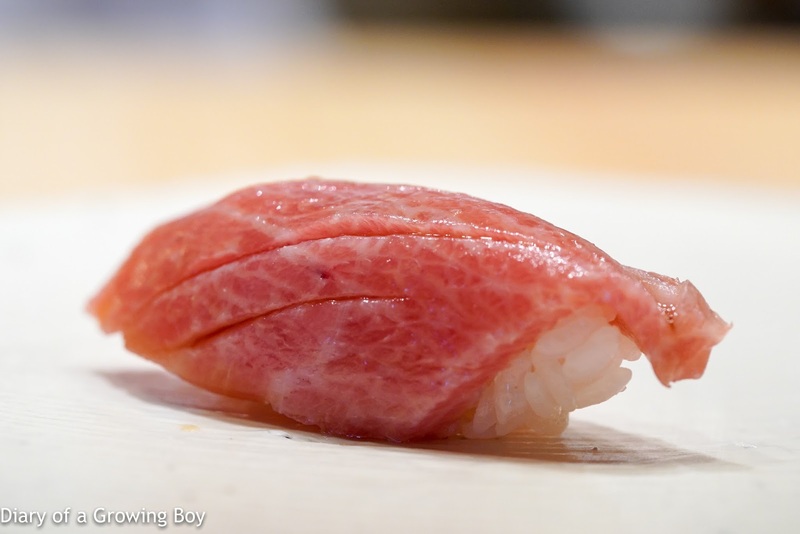 Fatty tuna (大トロ) - this was the shimofuri (霜降り) part of 大トロ, and different from the jabara (蛇腹) portion we're used to seeing, with those large striations of fat which often separates the slice of fish into several parts. 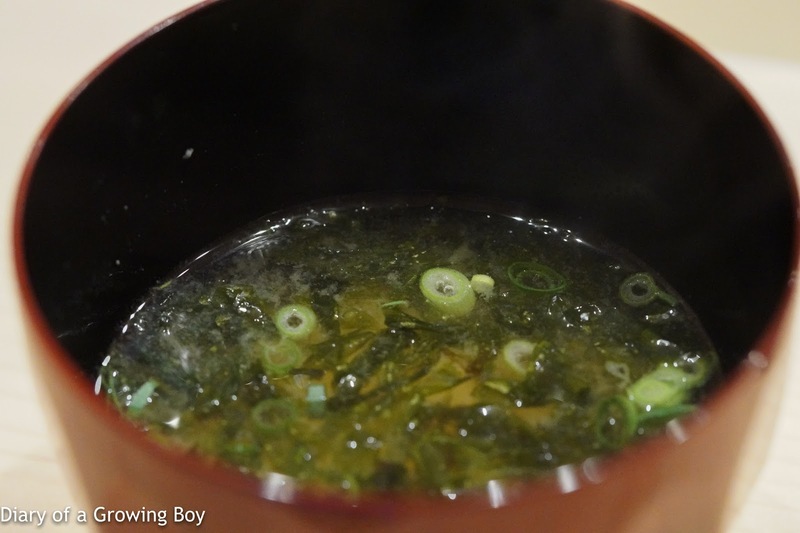 There was a good balance between the acidity in the shari and the fat inherent in the neta (ねた). At this point I noticed that one of the pieces served to the diner next to me had a grain of rice fall off. While this wasn't a mortal sin as, say, finding bones in your sashimi... it was nevertheless not something I would expect here. I did notice that Kobayashi-san's squeezing motions were rather delicate - like he was gently cupping the shari and neta together. Squid (墨烏賊) - now THIS was very interesting. 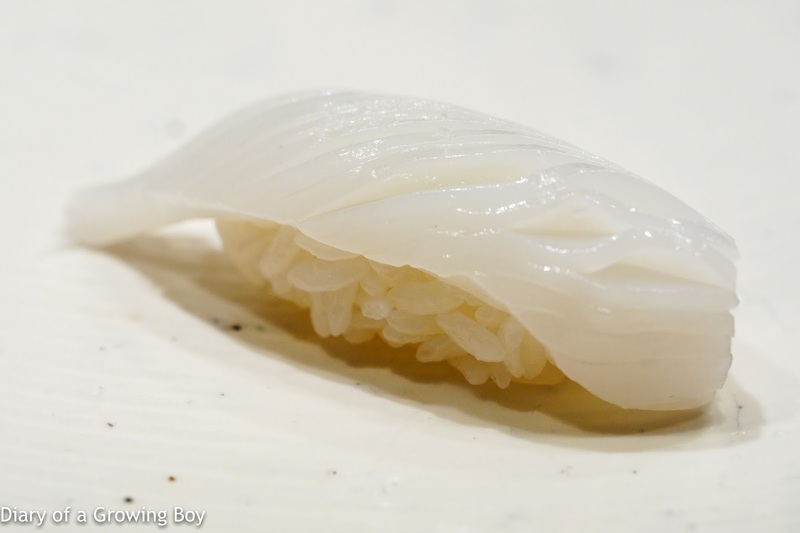 The slice of squid was fairly thick, and together with scoring and aging, this had the effect of making it chewy on the unscored bottom while the top was almost in a state of being semi-liquefied. The was the first piece where I actually tasted the wasabi. 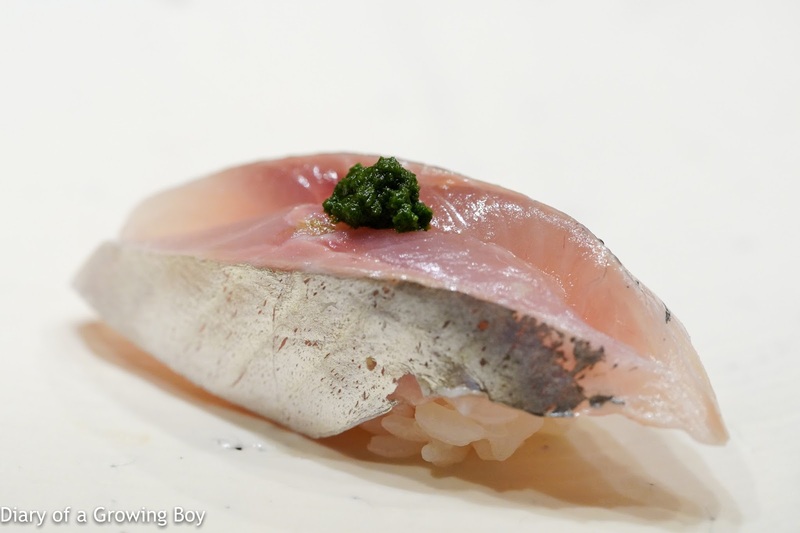 Horse mackerel (鯵) - topped with a dab of asatsuki (浅葱) and minced ginger. This was a pretty thick cut, but the texture was very nice and soft. 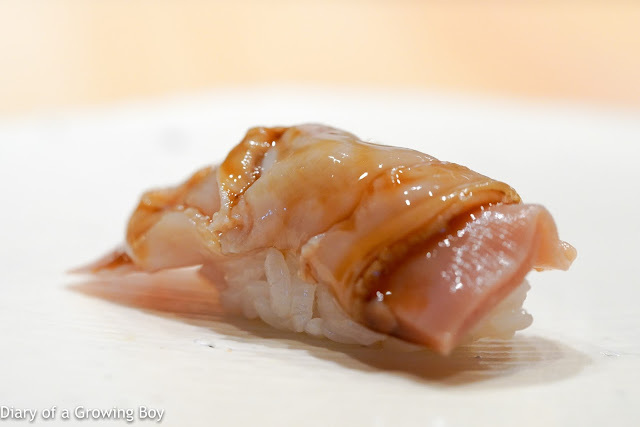 Clam shell (蛤) - the very best clam sushi I've ever had was at Sukiyabashi Jiro, and this one was very, very different. 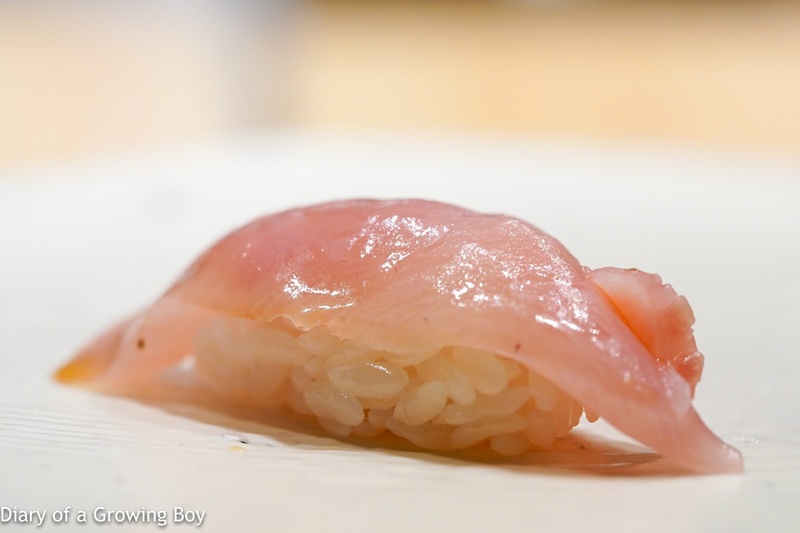 Yuzu zest was shaved on top of the tsume (つめ). When I picked it up with my fingers, the shari almost fell off... This clam was much thicker than I had expected, and way more chewy. 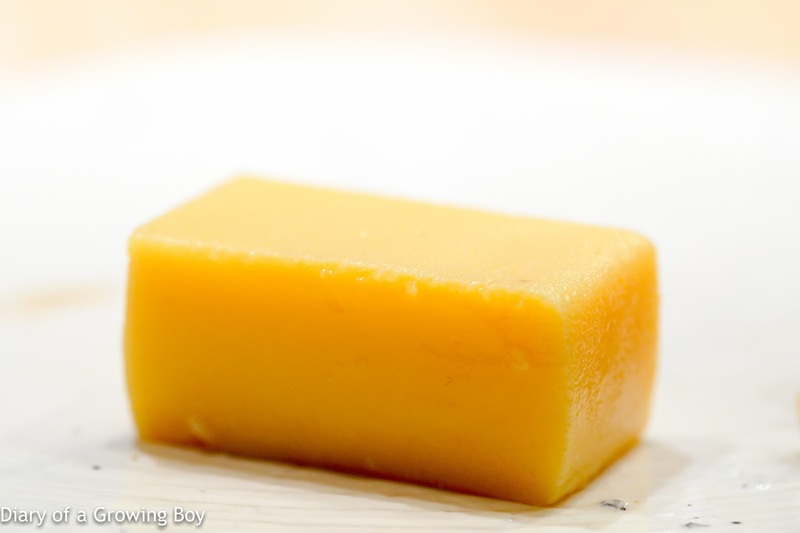 In fact, it took some serious effort to chew on it and cut it up with my incisors, but at the same time I loved how springy it was and how much it resisted the force coming from my teeth. Nice umami here, and great balance. Purple sea urchin (紫雲丹) - I recognized the box that the sea urchin came in, and sure enough, this came from Hadate Suisan (羽立水産) in Hokkaido. Really, really creamy. But I would expect nothing less from this particular sea urchin, from this particular source. 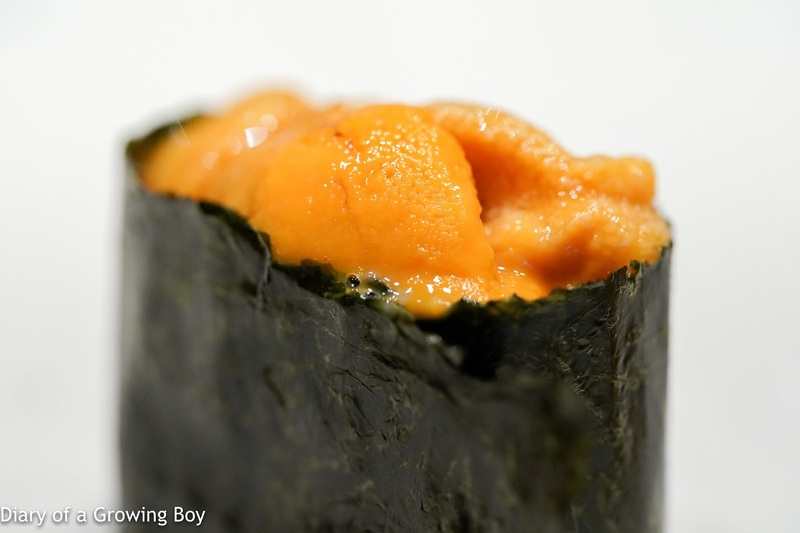 Japanese green sea urchin (馬糞雲丹) - easy to see how the sea urchin tongues had started to liquefy... so no surprise that it was creamy and melted in the mouth. 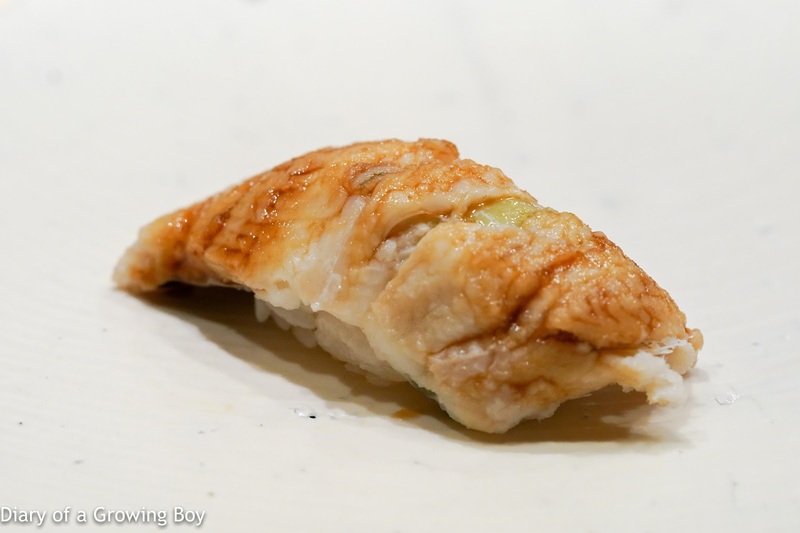 Conger eel (穴子) - very soft texture, with a slightly stronger dab of wasabi. Egg (玉子焼き) - this was undoubtedly the most unique piece of tamagoyaki I've ever had. The texture was so almost like Jell-O... and it was so much fun to play with it with my fingers trying to lift it up. 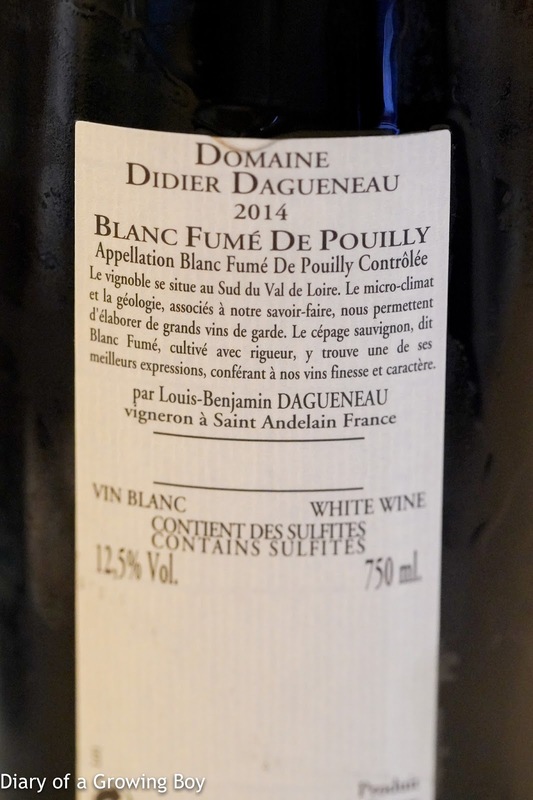 2014 Didier Dagueneau Blanc Fumé de Pouilly - served by the glass and obviously too oxidized. 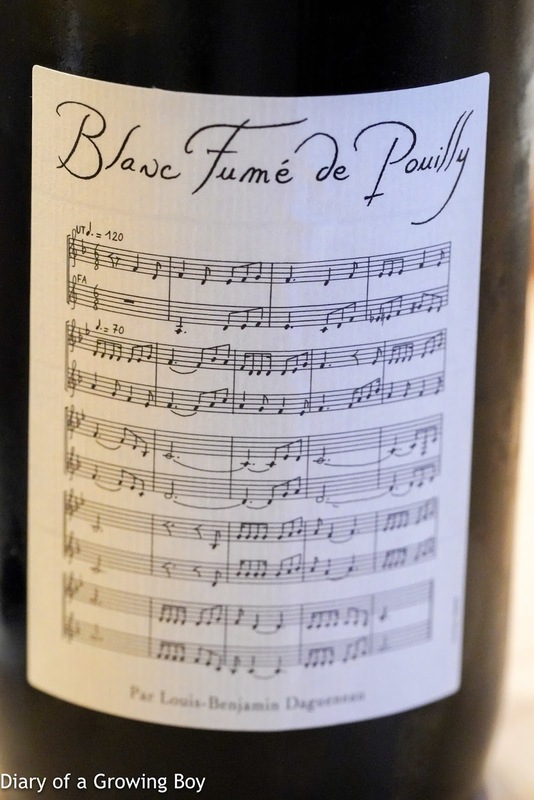 Good acidity, a little green apple, and a little spicy like pimento.